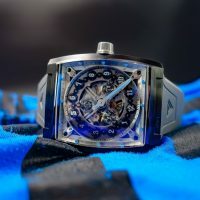 Founded by Mark Schwarz, former policeman turned watchdesigner turned creator of this exceptional timepiece, Vault Swiss presented their first V1 wristwatch at Baselworld 2018. As it turned out, the watch proves to be a huge success. The V1 embodies our personal spin on industrial design. Built in limited numbers by the phenomenal Andreas Strehler’s UhrTeil AG from the movement up, our unique concept ensures that no two pieces tell time the same way. The V1 is more than the first Vault watch; it is Vault. The V1 embodies our personal spin on industrial design. It’s no mystery where we got our inspiration; where else would we lock away a treasure like our in-house movement than inside our own horological vault? From that one thought we designed the V1 to not only look like an imposing bank vault, but to be constructed like one. After all, if time is money, your watch should be Fort Knox.